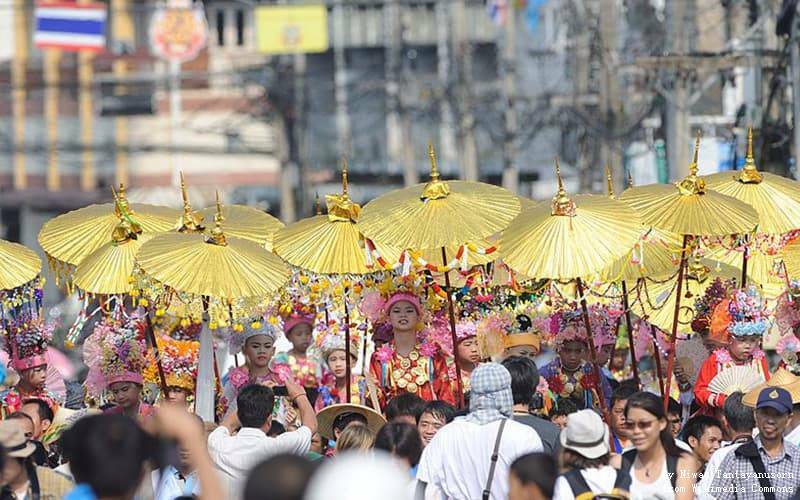 The Poy Sang Long is a known Thailand festival but, it is kind of a ceremony. It is a Shan or Tai Yai which is translated to “ordaining the beloved sons”. The ceremony involves young boys around age 7 to 14 and welcomes them to become a young Buddha. Initially, they are known as novices. The boys get involved in a 3 days ceremony and on the final day they change their attire and take their oath to become monks. According to their common belief, the ordination will eventually give them a lot of benefit in the future life. A lot of young boys are ordained at the same time. They are required to stay in the monastery for some period which can range from weeks to months. This festival is celebrated on a grand level in Mae Hong Son and is a beautiful site to witness. The ceremony is one of the tourist attractions and a lot of people from far and wide come to be a part of it. The festival is said to be originated from Prince Rahula, the son of Buddha. According to the monk tradition, Prince Rahula was very young when he abandoned his worldly life to follow in the footsteps of this father and became the first novice in Buddhism. He was also the youngest ordained novice ever and since then young boys from different family take inspiration from him and do the same and study Buddhist teaching. Locals living in Mae Hong Son province give great significance to monks and their teachings and hence a magnificent ceremony is held every year for this occasion. When is Poi Sang Long Festival? This festival usually occurs from anywhere between mid-March to mid-April. The ceremony is normally three days long, where young boys usually age between 7-14 years are ordained as a novice to become future monks. 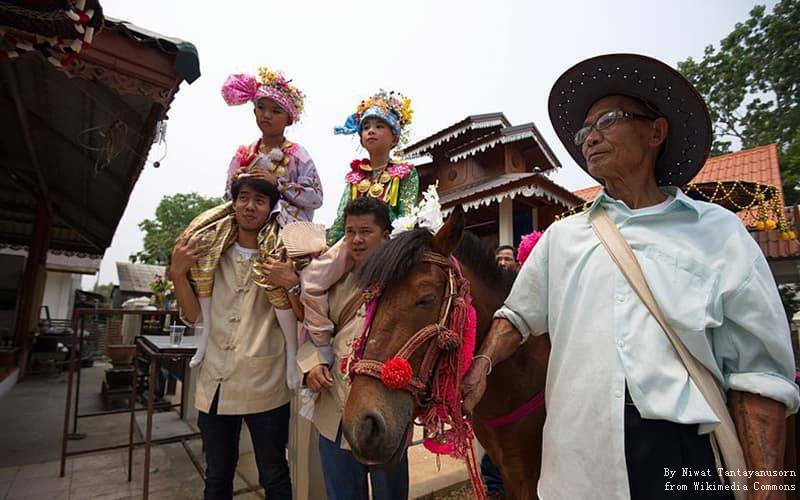 The ceremony is Mae Hong lasts for around 4 to 5 days unlike the ceremony in Chiang Mai which follow the normal schedule of 3 days. The ceremony of 2018 will be held on from April 2nd to 6th in Mae Song Son at Wat Klang. Poy Sang Long Festiva usually occurs in two temples namely: Wat Ku Tao and Wat Pa Pao. They are all in Chiang Mai. The former is a large place and more than 50 boys can be ordained in one ceremony however the latter is a comparatively smaller temple. The candidates are usually young boys who prepare themselves for the ceremony by shaving their head and eyebrows, wearing a snow-white turban, dressing up in elegant clothing, their face is decorated with makeup and they wear expensive jewels. They also wear flower head dressing for their visit to the shrine. Their journey is done either on horses or on a shoulder of an older relative. Poy Sang Long is a quite engaging and interesting event in Thailand. During the ceremony, the temple is filled with many people including the families of boys who wish to become future monks as well as people who come from different areas to visit such ceremony. The boys are engaged in a 3-day ceremony and given a lot of attention from their families. They are carried on the shoulders of their relatives around the temple. The first day of a three-day ceremony is called “Rup San Long”. The boys are the center of attention on this day. They are greeted with several gifts from families and offered appealing meals. After which they are a parade to temple to have their hair and eyebrows shaved. They are cleansed by taking bath in holy lustral water. Boys are clothed in elegant dresses. Temple parade is accompanied by musicians celebrating such a big step in these young boys' lives. Flutes, bands, and clash of cymbals are played for such a celebration. During this day, each boy is assigned 3 attendants: one for carrying him, one for protecting him from sun hence he carries a huge umbrella and the last one is to protect all the gold the boy has been gifted by his family. Boys are then carried back to their home and since they are treated like princes, it is forbidden to let their foot touch the ground. The second day is called “Kham Kaek” and It begins as early as 4 AM at Wat Pang Lo. Boys that are about to be young monks wear beautiful white turbans and are treated as an important member by their families. They are given full attention and are welcomed by delicious food and amazing dances. Boys are dressed up in elegant clothing and are decorated with jewelry. Their faces are decked with makeup. The idea of applying makeup and doing such elaborative décor on a person is significantly taken from their tradition of performing arts, where pra'ek, the main lead is fine-looking and unique. The boys are given the title of Sang Long or 'Look Kaew' (translated to jewel sons) and are treated like princes. They are even provided with servants called Ta Pae. Throughout the day, they are either carried on piggyback or in chairs. Carpets are rolled out for them. The boys are supposed to march to the temple to offer gifts to Buddha and to senior monks. During their parade to temple a group of people that are dancing and playing drums accompany them from behind. “Hae Khrua Lu” is the final ceremony performed in this festival. It is the day of ordination where young boys who wish to become monks take the oath. They reach Wat Pang Lo where the official ceremony begins. They are assigned as novice monks under the teachings of Buddha. During the ordination the young boys take permission from senior monks, who have been working as monks for many years now, to ordain them. After they are given permission, they take the oath and change their clothing to yellow robes. The purity of this ceremony is really peaceful. It is a day when young boys take a huge step in their lives by becoming a novice and you can be a witness to such a great scenario. If you want to experience local culture and appreciate the beautiful festival costumes as well as the celebration, please see our recommended tours below, for inspiraion. Our tours can be customized. If you are not interested in the above tours, just tell us your interests and requirements, and we will help you tailor-make a The Poy Sang Long Festival tour. All based your requirements!